Of the four companies that submitted CCiCap proposals deemed technically viable by NASA, ATK’s Liberty system was the odd one out, the only one not receiving a funded agreement. That raises the question: will ATK and its partners, notably EADS Astrium, continue to pursue development of the full system or some subset of it, like the launch vehicle? The company’s supporters in Congress have been more vocal, though. “I am disappointed and disheartened by the news that NASA has excluded ATK from the companies” that won CCiCap awards, said Rep. Rob Bishop (R-UT) in a statement. “It was my understanding that ATK’s Liberty proposal ranked very high in technical merit, and was the lowest-risk option,” he added, although NASA has yet to disclose the details of its selection process. In comments Bishop and his office provided to a local newspaper, the Ogden Standard-Examiner, he suggested political factors may have played a role. “I have been concerned that favoritism may be playing far too prominent a role in NASA’s decision-making process, especially with regard to companies closely tied to key NASA officials,” he said, citing among other factors various visits by NASA leadership to some of the companies that won awards but not to ATK. ATK officials involved with Liberty had previously indicated that the company would continue its efforts on the program if it didn’t get an award, albeit at a slower pace. DeYoung’s comments hint that progress on Liberty could come at a far slower pace—or possibly not at all. 6 comments to Will ATK continue Liberty? A little reality check here. The Liberty system first stage was to use a 5 segment solid rocket booster design derived from the space shuttle 4 segment solid rocket boosters. The 5 segment motor has been tested horizontally at the company’s factory in Utah. Confidence is high that the motor would probably perform adequately in use but it is completely untested in flight. The second stage of the Liberty system was to use a design derived from the Ariane lifter operated by the European Space Agency. The design needed some non-trivial re-engineering to be suitable for the Liberty system. It needs strengthening and redesigning for different load paths just for starters. Plus its engine was never designed for air-start although many people believed that particular issue could probably be resolved without too much engineering hassle. Compare this with the two launch systems the other competitors are using, the Atlas 5 and the Falcon 9 which are already operational. Falcon 9 is a newer design but is through its testing phase and now has commercial contracts with NASA and commercial satellite operators. Atlas 5 has been operational for quite a while with many, many successful launches under its belt. The ATK proposed launch system had no real chance against these two systems if the competition was based on technical merit. They were never really in that part of the competition. For the manned part of the system (the capsule or mini-shuttle or whatever it was to be for each competitor) Liberty proposes using a capsule design made out of composite material for the shell. Work is not that far along on the project and they really don’t have much in the way of hardware to show. Compare that to the other competitors designs, the Sierra Nevada Dream Chaser (a mini-shuttle reusable space plane design, the Boeing CST-100 (a fairly standard updated Apollo capsule type vehicle), and the SpaceX Dragon (also a capsule design but built to be reusable). All of the competitors designs are much, much farther along than the Liberty composite capsule. 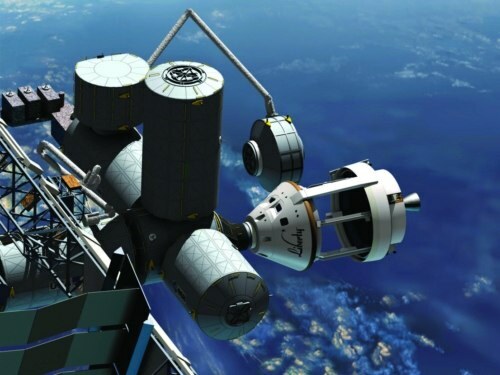 One of them, the SpaceX Dragon, has already made cargo delivery to the International Space Station. As you can see, the Liberty capsule never really had a chance against these other vehicles as long as the competition was based on technical merit. It is possible that the Liberty system could have been a contender if they had started work a couple of years sooner and got farther along with making their system a reality rather than mainly a power-point show with a lot of interesting ideas. But that didn’t happen. And NASA is not in the mood to wait the extra time to see if it might happen. Right now we have no vehicles or systems that can launch our own Astronauts into space and NASA wants that situation remedied soonest. Thus the three competitors that are expected to have operational systems the soonest are the ones that won the competition. There was a lot of fear among the “New Space” crowd that the ATK Liberty system might sneak into a winning slot with a sub-standard proposal due to their political influence, which is considerable. But it looks like that didn’t happen. It looks like the three proposals with the highest technical merit actually made it across the finish line. It surprised some. Yes–they mentioned “political factors may have played a role..”…ATK wanted political factors to play a role so that they were selected. When they were not selected, it may be ATK calling the kettle black. Lost in all the discussion is where all the other companies were in the development phase, technical risk, ATK lack of experience in being a prime for a whole spacecraft, etc. ATK got billions of dollars for the boosters for constellation, still is working on SLS, and is upset since it did not win a contract??? So if the SLS boosters ever go to open competition and it does not win, we should know what to expect. As one person mentioned, why did not they not put forward something less expensive on the 4 segment SRB? Why did not not forward a capsule on the Atlas V—nearly forgot the capsule is from LM….All these factors and more hurt ATK. Thanks for that. That leaves the ESA without a route to manned spaceflight. The ESA if they wanted their own manned space flight system could get it quickly by using the Ariane 5 core stage alone with the addition of a second Vulcain engine, capable of carrying a Dragon-sized capsule to orbit. Even the Dragon is larger than it needs to be just to LEO. If you made a capsule half its size to carry just three passengers, then by cutting the size of the Ariane 5 core to half-size you could loft the half-size capsule to orbit on just a single Vulcain engine. Given all the technical hurdles and competition…I doubt there is a business case for ATK to self fund Liberty. With 3 strong contenders that already have hardware built, Liberty would be to far behind to take market share launching payload to the ISS. It occurs to me that ESA could buy a refurbished Dragon shell if they seriously wanted manned capability on the less expensive side. If they bought just the shell without the innards and plumbing, and perhaps without the PicaX heatshield then Maybe ITAR might be not much of an issue. They have the technical talent to design and install the systems themselves, just not the money to produce a vehicle from a blank sheet of paper. Anyway it’s just a thought. But SpaceX might appreciate an aftermarket for their previously flown Dragons.